People have children. Your siblings, your friends, some of them may have children, you may even have your own child. Some people have children before they are married and some people marrying for the second time have several children… remember the Brady Bunch? 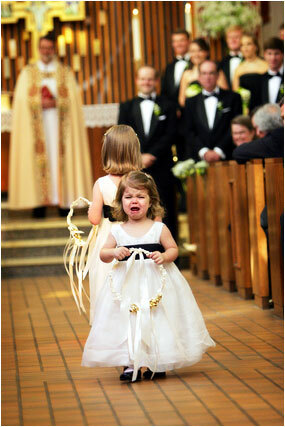 Including children in your wedding ceremony can make a lovely experience for everyone if handled properly. Give the children age appropriate tasks. 2 yr olds can be very unpredictable and asking them to do more than carry a basket of flowers or a ring pillow may be beyond their grasp. Hire someone to help. Check with local elementary or pre-schools to see if any of the teaching aides would be interested in doing some ‘Nanny” duty. The parents may want to actually enjoy themselves and not spend all day worrying if the kids are going to do the right thing. 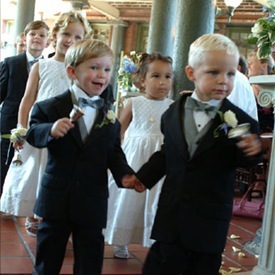 Remember – teachers have been trained how to handle precarious situations and you will need the extra help at the rehearsal as well as the wedding. Practice, Practice, Practice. Older children like tweens and teenagers might be able to recite a poem or do a reading. Make sure they attend the rehearsal dinner so you can do a sound check. even the little ones need to practice how to handle their tasks… no matter how simple it seems to you. Back up Plan. Kids of school age are notorious for bringing home every germ in the world. Be prepared that one of the kids may come down with pink eye, an ear infection, strep throat or even just a bad case of nerves. These things can throw your plans severely out of whack if you are unprepared. Remember, they are not small people, they are children. Things that seem simple to you are much harder for them. On top of it, they do not understand the complexity of each and every detail. Sure, they want to be a part of this beautiful thing but can be frightened, nervous and when that happens, mistakes are made. If you are not ready to have a child forget his or her line, drop the basket, spill something (or whatever) then, you probably shouldn’t have children in your wedding. If you can go with the flow and overlook the tiny obstacles that may lie ahead, you will create a memory that they will share with you for a lifetime…. not to mention the irresistible photos!